Remember when one of the most popular social networks you used to be on made you rank your friends in a “Top 8” order? Man, that sucked. Of course, since Facebook’s inception, Myspace has long become abandoned and forgotten by teens, college students, and adults alike — except for those who are trying to promote their music. Oh, yes, music. This is exactly what Myspace has left going for it, and it’s the focus of what the once-reigning social network aims to rebrand itself under according to this teaser video released yesterday of a Pinterest-meets-Windows-8-Metro-UI new design. As you can see in the clip, Myspace is finally integrating a fuller screen interface with larger blocks of photos, album covers, and status bars. It’s visually more attractive and in tune with today’s web design aesthetics for sure, and still incorporate the use of music in various facets of Myspace functionalities. For example, users will be able to search artists for albums or particular songs, or upload music along with a wall post to their friends. 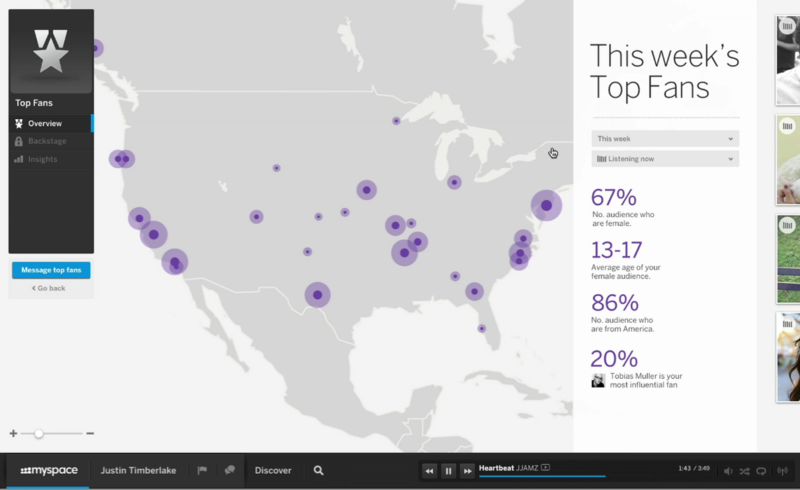 They can also curate playlists and check out the demographics of who’s listening to the tunes. The video also comes with a nice little endorsement from the one and only Justin Timberlake, who bought an investment stake in Myspace last year. The teaser video revolves around how artists like JT can search network of friends and media connections, and how fans can feel closer to their favorite musicians by following their status updates and newly uploaded photos. Interested users can also sign up with Myspace via their other, ahem, more frequently-used social media accounts, such as Facebook and Twitter. 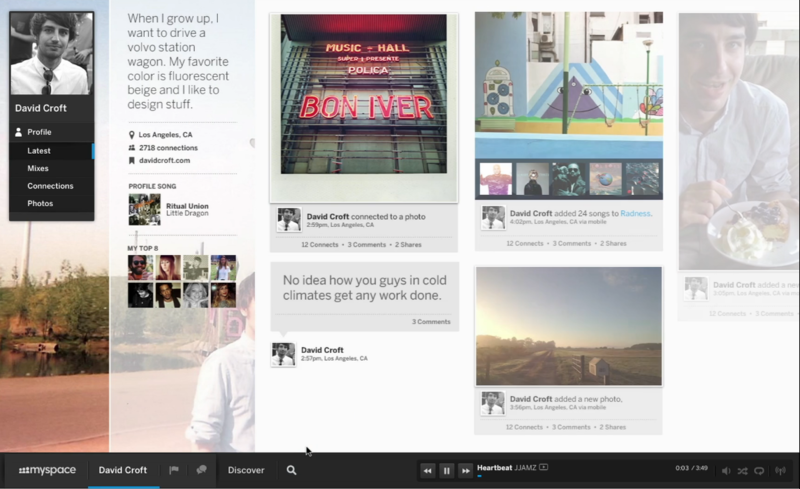 Unlike the old Myspace where you have to play songs on individual profiles, a static music bar remains at the bottom of the page so you’re always jamming to your favorite songs. Is it too little too late for Myspace to make a comeback? All we can say at this point is the use of a spinning vinyl on the current teaser landing page is more than an appropriate symbolism for something that’s long abandoned, forgotten, but can still be pretty cool if you let it — emphasis on the if. There’s no word on when the new Myspace will launch, but those interested in being the first to jump back on the wagon can put themselves on an e-mail waiting list at new.myspace.com.